This early Gothic castle, founded around 1240 is belongs among monuments, which have been named after and belonged, since their foundation up to the present, to members of a single lineage. Český Šternberk was conquered by the soldiers of Jiří of Poděbrady in 1467. The ruined castle was later returned to the aristocracy of Šternberk and they extended it in a ostentatious reconstruction securing the castle with powerful fortifications. The last significant adaptations took place in the second half of 17th century, when the original broken silhouette nearly disappeared. The castle, exceptional even among the Czech castles, not only for its historical significance but also due to its robustness and architecture. It was established by the Czech and Roman King Karel IV in 1348, who gave it the role of the treasury for the coronation insignia and the most valuable relics of the Holy Roman Empire. The basic construction of the Karlstejn castle took more than seven years, and the internal adjustments of the Chapel of the St. Cross were prolonged until 1365. 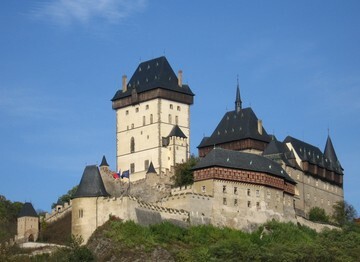 The castle fortification ought to have resisted any attacks in its time, which was confirmed in 1422 when Karlstejn was besieged by Prague citizens. By decree of the Caesar Rudolf II the damaged castle buildings were repaired at the close of the 16th century but in spite of this a gradual deterioration of Karlstejn began just then. In 1619 the coronation jewels together with the archives were taken away to Prague, in 1620 a garrison surrendered the castle to the army of Ferdinand II without a fight and, in 1648, the castle was conquered by the Swedes. The castle's deterioration continued through the 18th century, but the Hapsburg rulers were aware of the historical significance of Karlstejn as well. Therefor the Caesar Frantisek II and his son Ferdinand had the most seriously damaged parts repaired. After 1853 the supervision of this work was taken over by a newly established Central Monuments Protection Commission residing in Vienna. Karlstejn gained its present appearance under the purist adjustment works in 1887 - 1899 carried out to the designs of professor Friedrich Schmidt by the architect Josef Mocker. A predecessor to the present manor was a castle of the lords of Benesov in the 14th century, refashioned under the Sternberks in the late Gothic style, and, at the start of the 17th century, in the late Renaissance style. In the first half of the 18th century the extensive Baroque modifications of the manor structure took place under the Vrtba House authority, namely on the manor's southern section. In 1887 a successor to the Austro-Hungarian throne, Frantisek Ferdinand d'Este, became owner of Konopiště, and in 1889 - 1894 he had extensively restoration performed on the manor, this work having been connected with transformations into Gothic forms. The building plans were drafted by the Czech architect, J. Mocker, who participated with J. Schmotanz in designing adjustments to the interior, afterwards enriched with quality furnishings by the archduke Ferdinand. The Krivoklat castle is one of the oldest and most significant castles built by the Czech dukes and kings, the beginnings of which date back to the 12th century. 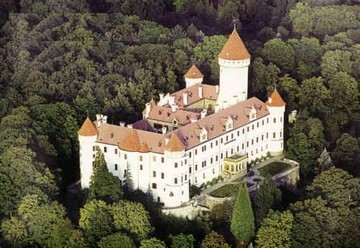 Under the rule of Premysl Otakar II and Vaclav II the foundation to this spacious and stately regal castle was laid. It was substantially rebuilt by Vaclav IV and later whole heartedly finished by Vladislav Jagelonsky. Krivoklat was seriously damaged by fire several times. It became a feared prison and its significance decreased rapidly. In the 19th century the Fürstenberks had the castle restored in Romantic style. 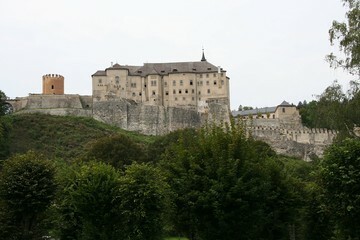 Founded in the 12th century, the ancient town of Loket is situated, not far from the famous west Bohemian spa towns, dominated by the mighty structure of the Medieval castle fortress. In 1434 the castle and the town was given by the Emperor Zikmund to the Šliks, under whom expensive modifications of the castle took place. After the development of the town a long period of stagnation occurred, the gradual end of which was manifested by the building of an ostentatious early Baroque town hall and a broad minded modification of the church constructions. However, the castle lost much of its importance. 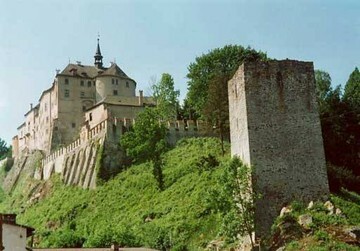 The castle was founded by Vok of Rozmberk in the first half of the 13th century. The first word of it is found in a scroll by King Wenceslas I in 1250. In 1612 the castle was passed on to the Švamberk family, only to be conquered seven years later by the Habsburg general, Charles Bonaventura Buquoy. The French family of the Buquoys, whom the castle was given to by the Emperor Ferdinand, stayed in Rožmberk and in nearby Nove Hrady where they lived from the 19th century until 1945. 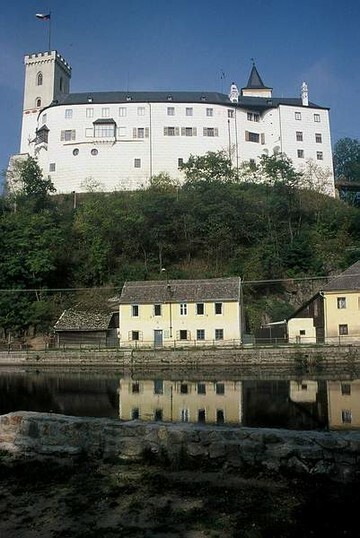 The original castle was established after the middle of the 13th century by Zdeslav from Sternberk. The building damaged by the Hussite wars was restored by Jiri Straznicky from Kravare; further additions were made by the family of Berka from Duba and Lipa in the 16th century. The repairs after the Thirty Year's War did not architecturally enrich the castle anymore. The dilapidating building was rebuilt by an architect from Vienna K. Kaiser in a Romantic style after 1886.